The city became the center of Art, Culture, Commerce and learning during the reign of Akbar and flourished under the reigns of Jehangir and Shahjahan. The thirty years of Shahjahan’s rule were comparatively peaceful and thus, his passion for Art & Architecture came into the fore and the world-famous architectural masterpieces were constructed like Taj Mahal, Red Fort (Lal Quila), Jama Masjid, Agra Fort and Moti Masjid (Pearl Mosque) etc. The Mughal clothing was also characterized by luxurious styles and was made with rich Indian textiles with heavy handiwork, precious gold & gems, stones and ornaments. One of the work was Zardozi. 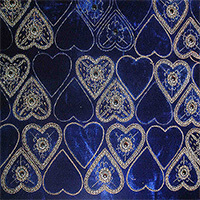 Zardozi or Zari is a part of hand embroidery, which is popular worldwide. We came to know about a group of minority women artisans in a rural area of Agra. This minority women artisan group named “Koshish” with 25 artisan members. They are working in their areas with responsibility and credibility. They come from different family background, some women are married & some are unmarried. They are not much educated and their families are dependent on them as they are the only source of income and their family is not financially strong. Initially, when we contacted these women and admired their work. They responded that they are not connected with Agra city and they don’t know much about the surroundings & happenings. They leant this Art form from their parents. They also mentioned that they were working for someone who paid them daily wage of 100 rupees for 10 hours job. Our Team decided to introduce and to promote their handmade Art, so that they would earn better and can secure the future of their families. We are trying to improve the living standard of our artisan community and focusing to improve their child’s education & health. They are now artisan partners of Master Piece Crafts wherein we say everybody’s company will help in everybody’s growth and these women artisans are making different products like Embroidered Boxes, Bags, Photo frames & Wall Arts etc. There is another group of artisan partners in which over 150 artisans are working for Master Piece Crafts and making Zardozi products like Ornaments, Boxes, Bags, Jewelry and other items using Zari, Cotton, Thread, Beads, Synthetic Fiber etc.